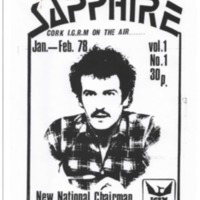 The first Cork LGBT organisation, the Cork Branch of the IGRM (Irish Gay Rights Movement) was set up in 1975 and the first gay centre opened on MacCurtain Street in 1976. This provided an important space for the LGBT community, with social and community activities being organised, including weekend discos, newsletters and a telephone helpline. The nascent LGBT community sought to challenge misinformation and prejudice about LGBT people, for example through media programmes on radio and on TV. At this stage the community identified as gay and lesbian, with little acknowledgment or respect for bisexual and transgender people.